Introducing a ShopWildThings original: the gorgeous and stunning Beaded Crystal Column. Our Acrylic Beads are PREMIUM QUALITY. You can see the difference in our product! Highly sought-after for weddings, large events and parties, these statement pieces are the perfect way to create a setting that won't soon be forgotten. We've personally created them with high-quality, beautiful crystal beads for a ravishing effect no matter where they're used. 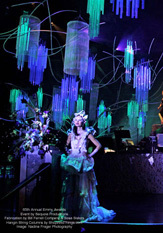 They're so stunning in fact that Colin Cowie, event planner to the stars, considers our crystal columns to be a staple for any one of his clients' A-list events. How come? 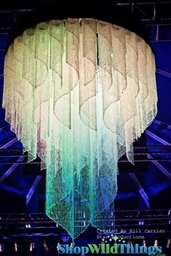 It may be because these shimmering crystal pillars are so sensational that they literally are able to create a fantasy land effect where there was previously just a mere event hall. (For example: unsightly pole? No more!) They come in both round and square varieties with three different lengths for both: nine feet, 14 feet and 20 feet. Aside from the frame shapes, some of the more pronounced differences for the two different types of decorative hanging crystal beads are that the square frame, also known as the "Brilliant" square crystal columns, have non-iridescent high-quality beads. 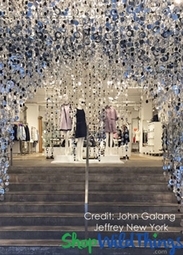 Conversely, the round frame, also known as the "Diamonds" Round Crystal Column, have faceted, iridescent beads that feature a pearlescent coating. 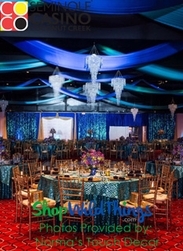 To properly use our decorative hanging crystal beads, please make sure that the event venue where they are intended to hang can support 9 to 36 pounds hanging from the ceiling. Every column comes with chains and hooks. Our crystal beads cannot be used any other way; they must be hung. If you have any questions whatsoever, our friendly professional staff is on hand to give you the answers. 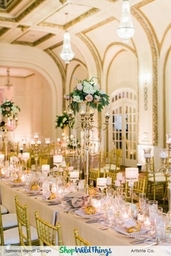 In the meantime, if you're looking for an elegant decorating solution, a way to make an impression as an event planner, or a way to make your wedding stand out heads above the rest, this is the sensational design solution for you. COMING SOON! Diamond Crystal Sparkling (Iridescent) Square Column - 9 Feet Long - PREMIUM QUALITY BEADS! Diamond Crystal Sparkling (Iridescent) Square Column - 14 Feet Long - PREMIUM QUALITY BEADS! Diamond Crystal Sparkling (Iridescent) Square Column - 20 Feet Long - PREMIUM QUALITY BEADS! Diamonds Crystal Sparkling Iridescent Column 9 ft - Round - PREMIUM QUALITY BEADS! Diamonds Crystal Sparkling Iridescent Column 12 ft - Round - PREMIUM QUALITY BEADS! Diamonds Crystal Sparkling Iridescent Column 14 ft - Round - PREMIUM QUALITY BEADS! Diamonds Crystal Sparkling Iridescent Column 20 ft - Round - PREMIUM QUALITY BEADS! 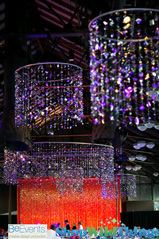 Brilliant Square Crystal Non-Iridescent Column - 9 Feet Long - PREMIUM QUALITY BEADS! Brilliant Square Crystal Non-Iridescent Column - 14 Feet Long - PREMIUM QUALITY BEADS! COMING SOON! 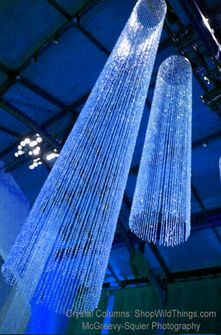 Brilliant Square Crystal Non-Iridescent Column - 20 Feet Long - PREMIUM QUALITY BEADS! Custom Bendable or Straight Metal Rod Curtains & Columns - Great for Curved Walls! PVC Round Hanging Column � 3' by 12' Long � USE ANY PVC STYLE! Pillar Stand Roman Column & Floral Riser - Adjustable - 36 1/2"